IT’S NEVER TOO LATE TO HAVE A CHANGE OF HEART. Six years ago, Chase Timberlake bought an engagement ring for his high school sweetheart Lori Reese. Then…life happened. Chase’s adventure photography career took off, Lori’s dream of getting into veterinary school came true, and their happily ever after never came to pass. When Chase’s jet-setting life takes a tragic turn, he returns to Eternity Springs a damaged man. Who better to help mend his spirit than the woman who has dedicated her life to healing broken wings? Long summer days spent together rekindles the love that never died and Chase dares to dream of a future he’d thought lost.But Lori can’t help but wonder whether this high-flying man really wants a small-town girl with roots sunk deep into the Colorado Rockies. Can she and Chase turn back the hands of time and pick up where they left off―and give forever a chance? 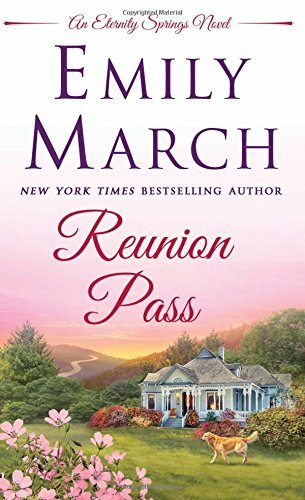 Reunion Pass is the eleventh installment in Emily March’s acclaimed Eternity Springs series.